One of the reviews was of an “informal underground psychdrone collective in Berlin” called Umbral. Here’s an excerpt from Mahoney’s fictional review of Umbral’s fictional Predawn Demo Tapes. A friend once gave me a homemade cd-r wrapped in brown paper and packaging tape. It was well worn with faint drawings of squid and astral charts, an old email address, a recipe for porridge. She said it was by Umbral before they became huge. Said she had seen them as an informal underground psychdrone collective in Berlin. Said now she could never move from Berlin. Said she even stopped trying. I gave it a listen while walking New York at night. It was like walking a half erased creation where streets were streets only by walking them and what was never walked on, never was to be. I made it out but two hours of me walks there still. Once Mahoney found out his book would be published, he sent the reviews around to bands he liked and asked them to become the bands he wrote about, and to record music for a tape to be released with the book. Greenfield musician and poet Daniel Hales (The frost heaves and hales.) 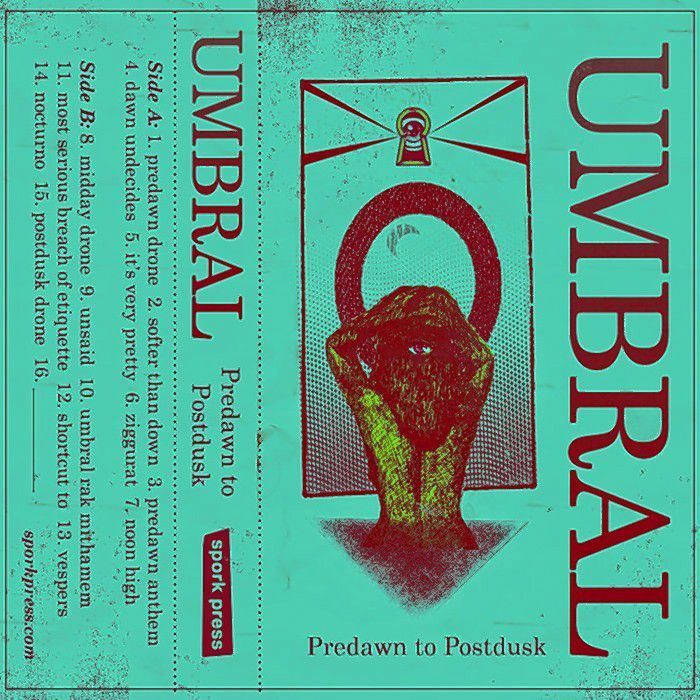 became Umbral, and after having so much fun recording for the initial tape, he decided to make a follow up called Predawn to Postdusk with JD Hairston from the band Rebel Base. Whatever the short distance between fictional and real, predawn and postdusk, atmosphere and headbob, or the said and unsaid, this new collection is a journey through it. Predawn to Postdusk is available from Sporkpress (shop.sporkpress.com) or on Bandcamp (umbralberlin.bandcamp.com). And don’t miss the release show: a psychedelic multimedia spectacle combining live music, site-specific drone installations, projections, shadow puppets, and more. It’s April 1 at 7 p.m. on two floors of the Pushkin Building at the corner of Federal and Main streets in Greenfield. Basemental appears twice monthly. Contact Will Meyer at wsm10@hampshire.edu.